Healthy Chutney recipes. Healthy Indian chutney recipes. healthy chutney recipes. healthy Indian chutney recipes collection. In India, there is a vast choice of Chutney to go with your food. These chutneys can be used for dosa, idli, vada, samosa, sandwiches, bhel puri, sev puri and all kinds of chaats. Its common to see some chutney in every kitchen as its used for Breakfast, Lunch and Dinner. We have sweet chutneys, spicy chutney, non spicy chutney and chutney powders. We have chosen ingredients which have a low glycemic index. So what goes into a healthy chutney? We have chosen chutneys from all over India and those that are healthy only. The classic Coconut Chutnety is made of coconut which is really a super food. Then you have the Green Chutney which is nothing but pudina and coriander and zero oil. Then you have the Lehsun Chutney which is made of garlic and chilli powder. See why coconut is good for usage in chutney. The fresh coconut has saturated fats but most of it is MCT (Medium Chain Triglycerides) which promote weight loss. The high fibre content 13.6 gm (45.3% of RDA) along with high lauric acid content of coconut improves cholesterol levels in the body. Improving the action of insulin secretion and lowering the raised blood sugar levels is yet another benefit of coconut for Diabetics. Coconut chutney recipe is the basic one to start with. Coconut chutney is made all over India and uses as an accompaniment to Idlis and Dosas mainly. If you have grated coconut on hand, it takes a few minutes to prepare. For a variation try the tomato coconut chutney recipe which is a popular dosai chutney served in Tamil Nadu. This cooked chutney stays well for upto 2 days in an air-tight container in the fridge, but it is best when freshly prepared. Coconut + coconut oil are a super combination for a healthy chutney. A classic South Indian accompaniment, the Coconut Thuvayal recipe is a slightly spicier coconut chutney made by blending coconut with roasted dals and spices in coconut oil. A dash of asafoetida boosts the aroma of this chutney while tamarind gives it an appetizing tang. The Coconut Thuvayal can be enjoyed with any meal. You can have it with idlis or dosas, or with curd rice, Sambhar rice or dal rice. Yes, a special chutney for dosa. Try the coconut corainder chutney recipe has the goodness of coconut, coriander and spinach with some roasted chana dal and made with zero oil. This chutney goes well with idlis and vada also. see why garlic is good for you to use in chutney. Garlic has been proven to lower cholesterol. The active ingredient allicin present in garlic aids in lowering blood pressure. Garlic is also alleged to help regulate blood glucose levels for diabetics. Garlic is great for the heart and circulatory system. Read here for complete benefits of garlic. The basic chilli garlic chutney recipe is quick and easy to make. Perfect recipe for those with cholesterol issues. A good variation is the carrot garlic chutney recipe which is excellent for the eyes + heart. Garlic tomato chutney recipe is a simple twist to garlic chutney by adding tomatoes and spring onions to it. see why coriander is good for your chutney. The antioxidants vitamin A, vitamin C and the quercetin present in coriander works towards strengthening our immune system. Coriander is a fairly good source of iron and folate – the 2 nutrient which help in the production and maintenance of red blood cells in our blood. Good for reducing cholesterol and for diabetics. Check our nutritious green chutney recipe which is used with snacks like samosa, vada, panki etc. see why mint (pudina) is good for your chutney. Mint (pudina) being an anti-inflammatory reduces the inflammation in the stomach and shows a cleansing effect. Sipping on a healthy drink like fresh mint and lemon tea is the best option to overcome nausea for mums-to-be. Moreover it's vitamin A (10% of RDA) and vitamin C (20.25%) serve as an additional boost to bring relief from cough, sore throat and also cold. See our zero oil green chutney recipe which will speed up the recovery of your sore throat and has no sugar added to it. What Ingredients go into a healthy chutney? 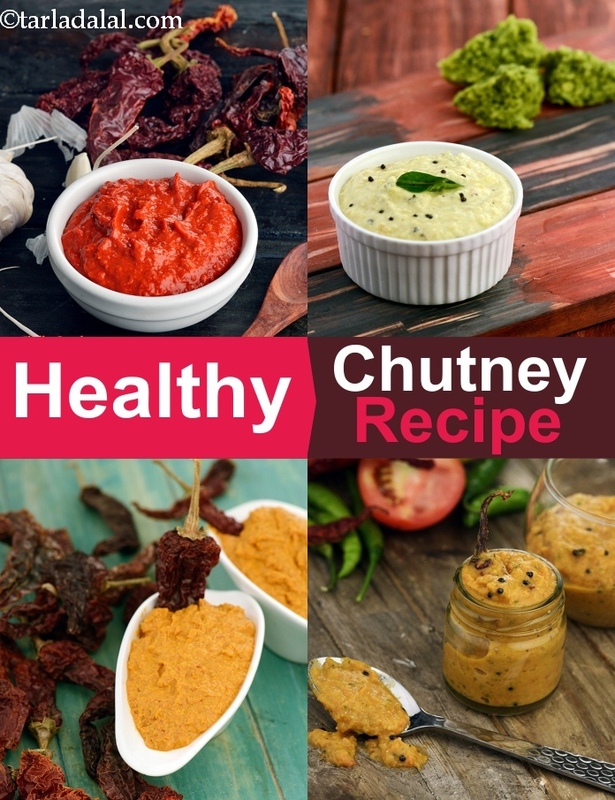 Enjoy our healthy chutney recipes. healthy Indian chutney recipes collection and other healthy breakfast articles below. An interesting combination of curds and phudina chutney, which shall surely (hyper)activate your gastronomic juices!